Every day we see clients improving their work environments to increase efficiency. But what about improving the process that gets them there? 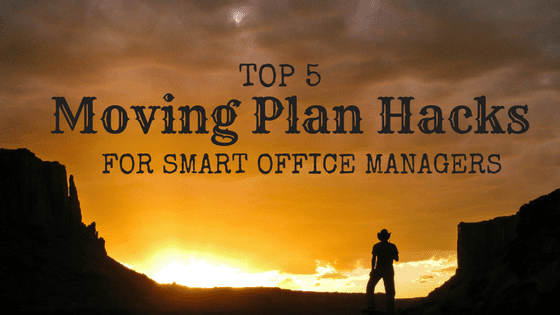 Many office managers forgo a moving plan to save time, only to spend even more time managing their office move on top of an already packed schedule. The most successful moves are those with a documented relocation strategy. A moving plan is key to keeping your relocation strategy on track. It helps you manage workflow and communicate with your team. There are a few things you can do to develop an effective moving plan, while freeing up valuable time. You can also use your moving plan as a guide for project deadlines to avoid scheduling conflicts. By setting aside a little time to plan ahead, you’ll save a lot of time scrambling to recover from mistakes. And you’ll reduce the overall stress of worrying about what comes next. Streamline communication so questions surrounding the upcoming move won’t distract you or anyone else from daily work. Choose one primary tool for communicating and use it to provide regular updates. Store files related to your move in a central location. Establishing methods for sharing important information makes it easier to communicate and keep people focused throughout the moving process. Note: email can be a huge distraction. If you’re sending out random notices you’re only contributing to a lack of focus in the office. Instead, summarize your progress and send updates once a week, or as often as makes sense based on the particulars of your move. Consider using a newsletter format. Start by sharing your moving plan timeline. You may provide more frequent updates the closer you get to moving day. Dedicating time to pack will ensure employees remain focused on the task at hand. They won’t have to worry about finding time to pack their offices, or feel like they have to swap work hours for packing to avoid staying late. Provide direction on how and what to pack – and when – so important items can be safely added at the last minute. Clear packing instructions will speed up packing and unpacking in the new office. With everyone following the same protocol, you won’t have anyone sitting around wondering what to pack next. Many hands make light work, so plan to have everyone on board for packing common spaces. Google Docs for filing sharing. A simple spreadsheet with columns for: Department, Lead Contact, Packing Date, Moving Date, and any Special Notes. Spreadsheets can be invaluable for small, self-managed moves. Professional office movers use move management software to keep the details of your move under control, allowing your team to collaborate with a professional move coordinator. Labels that provide destination details for every item to make moving and unpacking more efficient. Reusable moving boxes for easy and reliable transportation. Outsourcing your office move can free up loads of time that you use to keep your business moving forward. When hiring office movers, look for partners who have proven project management skills, and experience relocating a variety of businesses. When it comes to planning an office move, see why our movers are the best in the west. And across Canada. Putting even a few of these moving plan hacks in place can help free up your time and allow you to focus on the bigger business picture.